Q: How do I block an unwanted email sender? "Other than bouncing back to sender, or changing my email address, putting them in junk mail or a file, how do I block my abusive ex from sending me unwanted emails?" Q: How do I block junk mail from going to my iPhone and iPad? "I blocked a ton of emails from Outlook on my work PC but they still come to my iPhone and iPad. The block on my PC did the job, but for some reason, my iPhone and iPad cannot tell the difference. Please help! I can't stand getting bogus emails all day long!" In addition to facilitating our use of telephone and short messages, iPhone also allows us to send and receive emails anytime and anywhere, which is of great convenience for our work and life. However, if you are constantly harassed by advertising mails, spam mails or unwanted mails from some persons, you can block certain email addresses to stop receiving such harassment. This article will show you how to block emails on iPhone XS Max/XR/XR/X/8 Plus/8/7 Plus/7/6s Plus/6s/6 Plus/6/5S/SE or iPad to help you solve this problem. You are about to learn how to prevent emails from a specific email address from showing up in Mail app of your iPhone/iPad. Although you can't block email addresses within the Mail app or any other email app for iPhone, all email addresses that you have blocked from your inbox on computer will be blocked on your iPhone or iPad, too. Tip: To completely and permanently delete caches, temp files and any other traces on iPhone from unwanted mail address, it is highly recommended to erase data on iPhone XS Max/XS/XR/X, etc. To block email address on Gmail, this method will show you how to prevent receiving mails to iPhone inbox from blocked email addresses, while you can still check the emails from blocked addresses in Spam folder. Besides, you will not receive the notifications from the new emails from blocked email addresses, too. Step 1. Log into Gmail account on computer. Please visit https://www.gmail.com on your computer, enter your email address and password to sign into your Gmail account, then open your inbox. Step 2. Open an email from the address that you want to block. On your inbox, please find and select an email from the address that you want to block from your iPhone or iPad. Alternatively, you can turn to the Search bar on the top of the inbox, and type the name associated with the email address into the Search bar to search for the email address that you want to block. Step 3. Click "Block [Name]" option from the drop-down menu. You can click a downward-facing triangle in the upper-right corner to find out and click "Block [Name]" option. Here you might find out that the [Name] section will be replaced by the name of the sender. For example, to block emails from Cynthia Mela, simply click "Block Cynthia Mela" here. Step 4. Click "Block" option to confirm. After that a pop-up menu will prompt you to confirm your option, simply click "Block" option to block the selected email addresses. This will add the email address to your Gmail account's block list, which makes sure that you will not receive any emails from the blocked address in your inbox on computer, iPhone and iPad any more. If you are using iCloud email address or forwarding your emails via iCloud email, you can set up a mail rule on iCloud website to spam the mails from specific senders to your trash or junk folder directly using the filters. Step 1. Log into iCloud Mail on computer. Visit https://www.icloud.com/#mail on your computer to sign into your iCloud Mail with your Apple ID email address and password. Then please open your Apple Mail's inbox when you are logged in. Step 2. Click "Rules..." from Settings menu. You can find out the Settings menu (the gear-shaped icon) at the lower-left corner of the window. Click it to show up a pop-up menu where you should find and click "Rules..." option to open the Rules window. Step 3. Click "Add a Rule..." option. You can find this blue link at the upper right side of the window. If you can't find it, please make sure you are on the Rules window at first. Step 4. Enter an email address to block. on the fourth option, please select "Junk" from the drop-down menu. Step 5. Click "Done" button. After finishing all above operations, please click "Done" option. 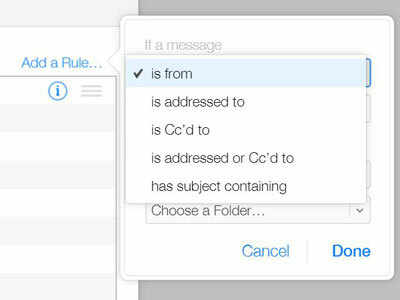 Thus all mails passing through your iCloud email address will be filtered by the rules you have set. To change or delete a rule, you might come back to the Rules window and click "i" icon beside the rule to manage it. Step 1. Log into Yahoo mail account on computer. Please go to https://mail.yahoo.com/ on your computer to sign into your Yahoo account with your email address and passcode. Step 2. Click "Settings" option. Open inbox on Yahoo, then click "Settings" button (the gear-shaped icon) at the upper-right side of inbox. If you are not using the latest Yahoo version, please update your Yahoo at first. Step 3. Add an email account to block. Click "More Settings" option at the bottom of the drop-down menu, click "Security and Privacy" option on the left on the window and click "+ Add" option which is on the right of "Blocked addresses" heading and in the middle of "Security and Privacy" section. Step 4. Enter an email addresses to block. Now, you might type the email address that you want to block in the "Address" text box at the top right of the window. Step 5. Click "Save" button. 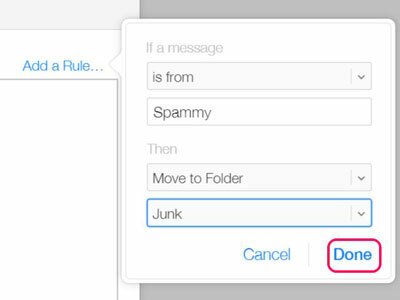 Then you might click "Save" button to add the email address to your Yahoo inbox's block list. And you will not receive messages from the blocked email address into Yahoo inbox on any platform, including your iPhone, iPad and computer. Outlook is the default name for Hotmail and Live accounts. 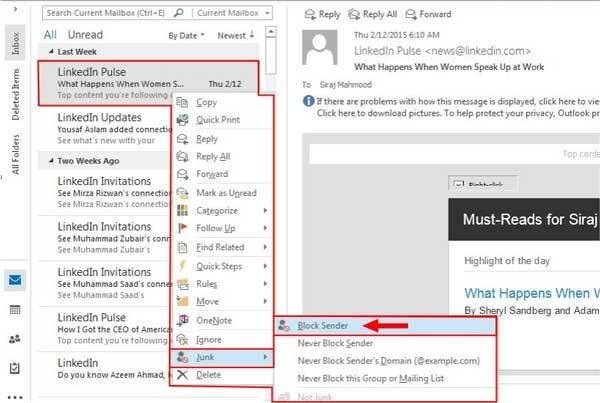 If you are using it, please refer to the following instructions to block unwanted mails. Step 1. Sign into Outlook on computer. Please go to https://www.outlook.com/ on your computer to log in to your Outlook account with your email address and password. Then open inbox of your Microsoft Outlook mail. Step 2. Go to Settings on Outlook. Please click the "Settings" button (the gear-shaped icon) at the upper right corner of Outlook window to bring out the drop-down menu; then scroll down to click "View full settings" option to open the Settings window. Step 3. Set up junk emails on Outlook. 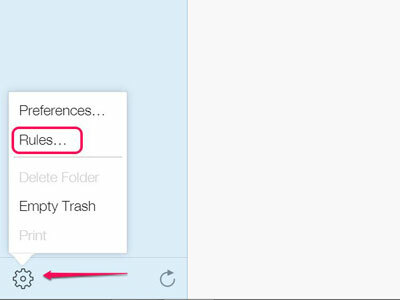 On Settings window, please click "Mail" tab on the left and click "Junk email" in the middle. Step 4. Add an email address to block. 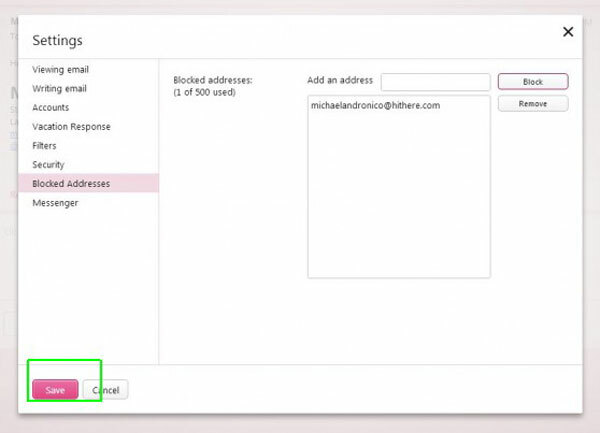 On the "Blocked senders" section, please type the email address that you want to block, and click "Add" button on the right of the email address to add this email address to the block list. Click "Save" button on the top to finish the operation. Thus you will not receive any messages from the blocked email addresses into your Outlook inbox, including the inbox on your iPhone. How to Print Calendar from iPad Pro/Air/mini/4?